We've been cooking up some magic for you! 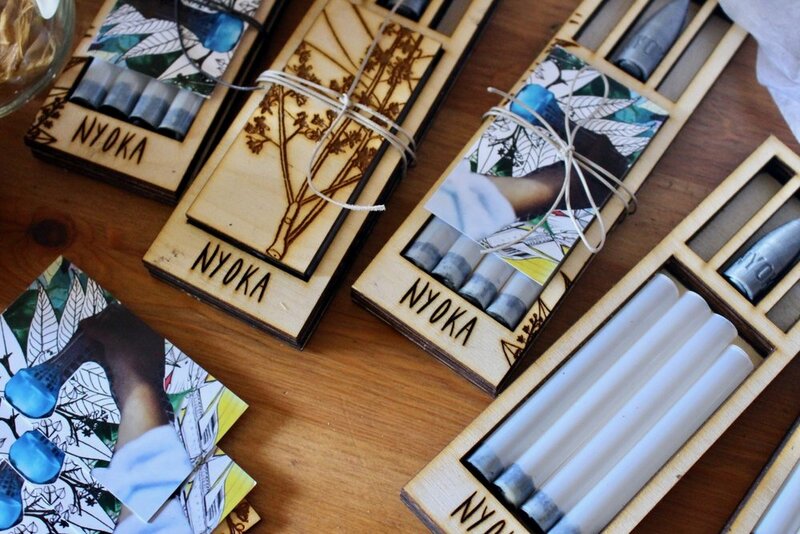 Here is a sneak peek of the Nyoka Light Wand Kits. We will be debuting them at the BC Tech Summit coming up next week, May 14- 16. We will be in Vancouver Monday - Thursday, make sure to come say Hi if you're around! - reusable kit we hope you use for reflls! These pictures are still prototypes, but we just had to show you what we've been working on. What we're particularly excited about is that dark plug that keeps all the glow in the Light Wand. The bio-plug is made from a specially treated charcoal, called biochar. Biochar is SUPER for the soil - the highly porous material acts like a sponge, holding onto water, nutrients, and providing ample surface area for microbes to flourish. Think of it as a prebiotic for the soil. is finished as a service to the Earth. We will be launching a crowdfunding campaign in the near future, so it won't be too long until you can get a Light Wand for yourself! Follow us on Facebook, Instagram, and Twitter @lightbynyoka, and subscribe to our email list for updates!